I have reflected on this for some time. Like the last 30+ years. What is your answer? When I asked a church staff this question, they responded a month later with a list of qualities that described a disciple. For example: Godly character, biblical literate, service, humility, shares faith, etc. And the list went on and on. I was exhausted at the end of our meeting because I was convinced that no one I knew would ever measure-up; including me. What I felt they were describing was a list of behaviors to make better disciples, but not to MAKE disciples. This was troubling to me. You could pragmatically help your people become better disciples but miss Jesus’ command to make disciples. Jesus set the tone of His mission by showing His disciples that the best way to become a better disciple is by making disciples. Taking this a step deeper. Is your ministry making better disciples or more disciples? What is the fruit of a disciple? Simply put, the fruit of a disciple are disciples who are making disciples. We have taken the mystery of what a fruitful disciple does in the Disciplemaking Collective. 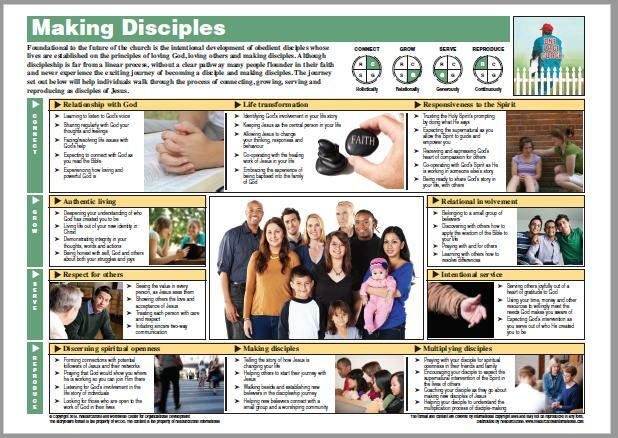 We use a simple path to help disciples assess where they are on their disciplemaking journey called the Disciplemaking Coaching Guide and Storyboard (see image above). CLICK HERE for more information.